. The performance parameters of a photodetector are responsivity, quantum efficiency, response time and dark current.
. Any particular semiconductor can absorb photon over a limited wavelength range. The highest wavelength is known as cut-off wavelength (λc). The cut-off wavelength is determined by bandgap energy Eg of material. λc cut-off wavelength is in m.
Typical value of λc for silicon is 1.06 µm for germanium it is 1.6 µm. 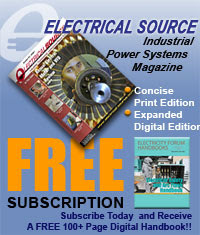 Where, Ip is average photocurrent. Pin is average optical power incident on photodetector.
. Absorption coefficient of material determines the quantum efficiency. Quantum efficiency η < 1 as all the photons incident will not generate e-h pairs. It is normally expressed in percentage.
. The responsivity of a photodetector is the ratio of the current output in amperes to the incident optical power in watts. Responsivity is denoted by ℜ.
. Responsivity gives transfer characteristics of detector i.e. 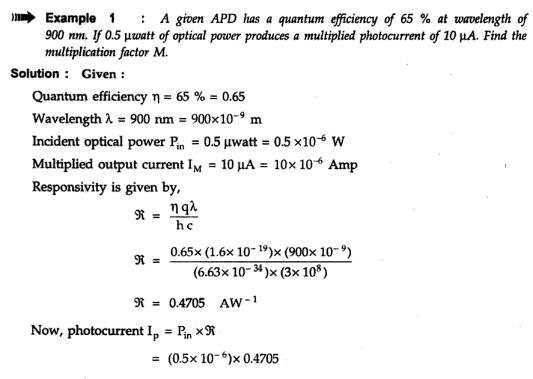 photo current per unit incident optical power. Silicon pin photodiode at 900 nm → 0.65 A/W. Germanium pin photodiode at 1.3 µm → 0.45 A/W. In GaAs pin photodiode at 1.3 µm → 0.9 A/W.
. 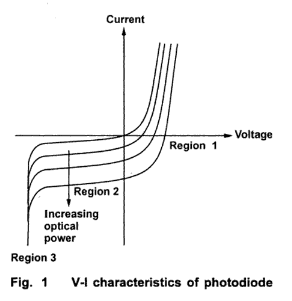 In order toconvert the modulated light back into an electrical signal, photodiodes or photodetectors are used. As the intensity of optical signal at the receiver is very low, the detector has to meet high performance specifications. - The conversion efficiency must be high at the operating wavelength. - The speed of response must be high enough to ensure that signal distortion does not occur. - The detection process introduce the minimum amount of noise. - It must be possible to operate continuously over a wide range of temperatures for many years. - The detector size must be compatible with the fiber dimensions. 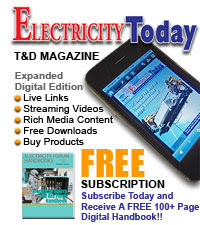 Id is dark current i.e. current that flows when no signal is present. Is is photo generated current due to incident optical signal. Fig. 1 shows a plot of this equation for varying amounts of incident optical power.
. Three regions can be seen forward bias, reverse bias and avalanche breakdown. i) Forward bias, region 1 : A change in incident power causes a change in terminal voltage, it is called as photovoltaic mode. If the diode is operated in this mode, the frequency response of the diode is poor and so photovoltaic operation is rarely used in optical links.
. Responsivity of photodiode is defined as the change in reverse bias current per unit change in optical power, and so efficient detectors need large responsivities. iii) Avalanche breakdown, region 3 : When biased in this region, a photo generated electron-hole pair causes avalanche breakdown, resulting in large diode for a single incident photon. Avalanche photodiodes (APDs) operate in this region. APDs exhibit carrier multiplication. They are usually very sensitive detectors. Unfortunately V-I characteristics is very steep in this region and so the bias voltage must be tightly controlled to prevent spontaneous breakdown.
. PIN diode consists of an intrinsic semiconductor sandwiched between two heavily doped p-type and n-type semiconductors as shown in Fig. 2.
. Sufficient reverse voltage is applied so as to keep intrinsic region free from carriers, so its resistance is high, most of diode voltage appears across it, and the electrical forces are strong within it. The incident photons give up their energy and excite an electron from valance to conduction band. Thus a free electron hole pair is generated, these are called as photocarriers. These carriers are collected across the reverse biased junction resulting in rise in current in external circuit called photocurrent.
. 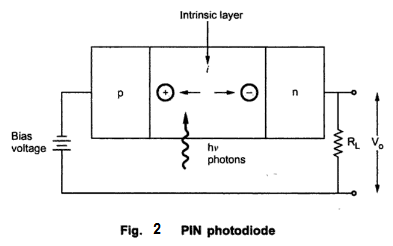 In the absence of light, PIN photodiodes behave electrically just like an ordinary rectifier diode. If forward biased, they conduct large amount of current.
. PIN detectors can be operated in two modes : Photovoltiac and photoconductive. In photovoltaic mode, no bias is applied to the detector. In this case the detector works very slow, and output is approximately logarithmic to the input light level. Real world fiber optic receiver never use the photvoltiac mode.
. In photoconductive mode, the detector is reverse biased. The amount in this case is a current that is very linear with the input light power.
. The intrinsic region some what improves the sensitivity of the device. It does not provide internal gain. The combination of different semiconductors operating at different wavelength allows the selection of material capable of responding to the desired operating wavelength.
. 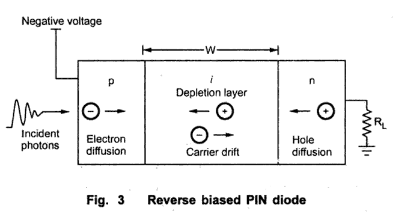 Consider a reverse biased PIN photodiode. Jdr is drift current density due to carriers generated in depletion region. Jdiff is diffusion current density due to carriers generated outside depletion region. Φ0 is incident photon flux per unit area. Dp is hole diffusion coefficient. Pn0 is equilibrium hole density. i) Transit time of photocarriers within the depletion region. ii) Diffusion time of photocarriers outside the depletion region. iii) RC time constant of diode and external circuit.
. 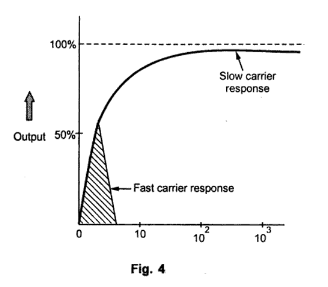 The diffusion process is slow and diffusion times are less than carriers drift time. 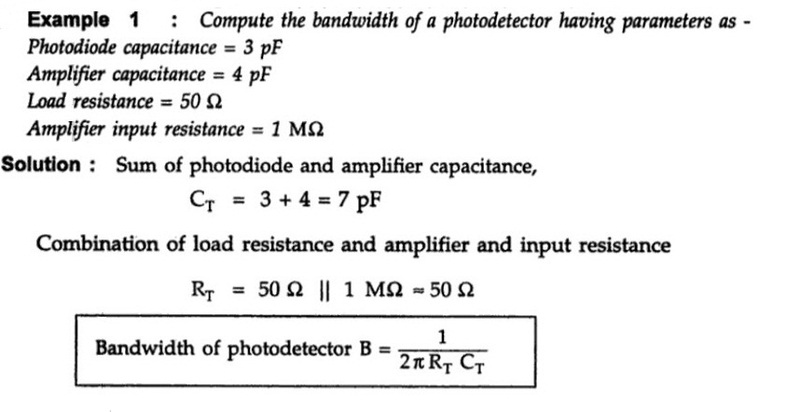 By considering the photodiode response time the effect of diffusion can be calculated. Fig. 4 shows the response time of photodiode which is not fully depleted. RT is combination input resistance of load and amplifier. CT is sum of photodiode and amplifier capacitance.
. When a p-n junction diode is applied with high reverse bias breakdown can occur by two separate mechanism direct ionization of the lattice atoms, zener breakdown and high velocity carriers causing impact ionization of the lattice atoms called avalanche breakdown. 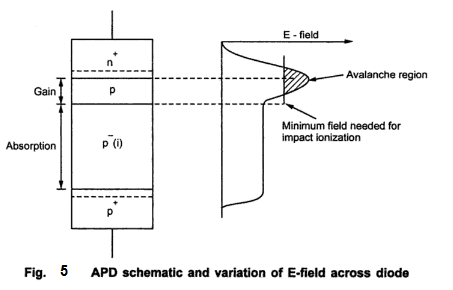 APDs uses the avalanche breakdown phenomena for its operation. The APD has its internal gain which increases its responsivity.
. Fig. 5 shows the schematic structure of an APD. By virtue of the doping concentration and physical construction of the n+ p junction, the electric field is high enough to cause impact ionization. Under normal operating bias, the I-layer (the p- region) is completely depleted. This is known as reach through condition, hence APDs are also known as reach through APD or RAPDs.
. Similar to PIN photodiode, light absorption in APDs is most efficient in I-layer. In this region, the E-field separates the carriers and electrons drift into the avalanche region where carriers multiplication occurs. If the APD is biased close to breakdown, it will result in reverse leakage current. Thus APDs are usually biased just breakdown, with the bias voltage being tightly controlled. IM = Average value of total multiplied output current. IP = Primary unmultiplied photocurrent.
. Metal-semiconductor-metal (MSM) photodetector uses a sandwiched semiconductor between two metals. The middle semiconductor layer acts as optical absorbing layer. A schottky barrier is formed at each metal semiconductor interface (junction), which prevents flow of electrons.
. When optical power is incident on it, the electron-hole pairs generated through photo absorption flow towards metal contacts and causes photocurrent.
. MSM photodetectros are manufactured using different combinations of semiconductors such as – GaAs, InGaAs, InP, InAlAs. Each MSM photodetectors has distinct features e.g. responsivity, quantum efficiency, bandwidth etc.
. With InAlAs based MSM photodetector, 92 % quantum efficiency can be obtained at 1.3 µm with low dark current. An inverted MSM photodetector shows high responsivity when illuminated from top.
. A GaAs based device with travelling wave structure gives a bandwidth beyond 500 GHz.